WGMS provides standardized observations on changes in mass, volume, area and length of glaciers with time (Fluctuations of Glaciers), as well as statistical information on the distribution of perennial surface ice in space (World Glacier Inventory), and special events. All data and information is freely available for scientific and educational purposes. The use requires acknowledgement to the WGMS and/or the original investigators and sponsoring agencies according to the available meta-information. The Fluctuations of Glaciers (FoG) database contains observations on glacier changes in length, area, volume and mass. In addition it includes information on glacier-related special events such as surges, claving activities, rock falls onto glaciers, lake outbursts, ice avalanches, eruptions of glacier-clad volcanoes or related protection work including prospection and scientific analysis. 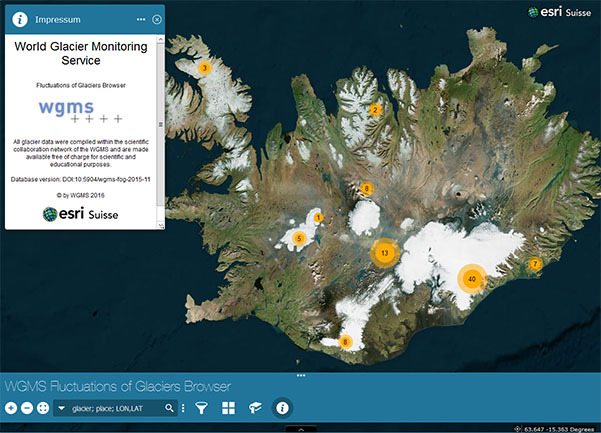 In order to get an overview on available glacier fluctuation series or to search for information of a specific glacier, use the WGMS Fluctuations of Glaciers Browser. The Browser allows you to directly download minimal data series of glacier changes together with corresponding survey and reference years. Full measurement details for individual observation series as well as larger datasets can be ordered by email. The same email can be used to report corrections and new data. You can use the following OGC services to integrate the above used Fluctuations of Glaciers meta-data layer directly from desktop GIS software products (e.g. QGIS, ArcGIS, or Google Earth) as well as other applications such as MapServer. The Open Geospatial Consortium (OGC) Web Feature Service (WFS) provides an interface standard that allows a client to get geographical feature data from an internet server using platform-independent requests. The standard also specifies means for a client to request information about the server capabilities. Many commercial and open source GIS and mapping software have client-side support for WFS. The general request link can be modified as needed to retrieve specific data. For more information, see the GeoServer WFS Reference page. WFS options do allow retrieval using CSV, GML, GeoJSON, KML, and Shapefile formats. The Open Geospatial Consortium (OGC) Web Map Service (WMS) provides an interface standard for requesting geo-registered map images. A request defines the geographic layer(s) and area of interest to be processed. The response to the request is one or more geo-registered map images (returnedas JPEG, PNG, etc) that can be displayed in a browser application. The interface also supports the ability to specify whether the returned imagesshould be transparent so that layers from multiple servers can be combined or not. For more information, see the GeoServer WMS Reference page. The Open Geospatial Consortium (OGC) Catalogue Service for the Web (CSW) support the ability to publish and search collections of descriptive information (metadata) for data, services, and related information objects.Metadata in catalogues represent resource characteristics that can be queried and presented for evaluation and further processing by both humans and software. Catalogue services are required to support the discovery and binding to registered information resources within an information community. The interface standards specify the interfaces, bindings, and a framework for defining application profiles required to publish and access digital catalogues of metadata for geospatial data, services, and related resource information. Metadata act as generalised properties that can be queried and returned through catalogue services for resource evaluation and, in many cases, invocation or retrieval of the referenced resource. Catalogue services support the use of one of several identified query languages to find and return results using well-known content models (metadataschemas) and encodings. For more information, see the pyCSW-Features page. For downloading the current and earlier versions of the full Fluctuations of Glaciers database got to database versions. For a full overview of glacier data freely available through the Global Terrestrial Network for Glaciers, please visit the GTN-G website.